This PDF 1.3 document has been generated by , and has been sent on pdf-archive.com on 03/05/2016 at 16:18, from IP address 178.10.x.x. The current document download page has been viewed 369 times. File size: 76 KB (9 pages). 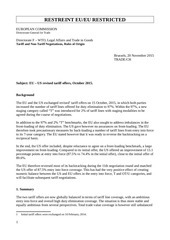 Subject: EU – US revised tariff offers, October 2015.
agreed during the course of negotiations. will facilitate subsequent tariff negotiations. Initial tariff offers were exchanged on 10 February, 2014.
signaled on a number of occasions that it will offer full duty elimination for automobile tariff lines. achievement during negotiations leading up to the endgame. 98% on EU exports to the US in absence of motor vehicles. may counter the trade value imbalance but only to a small extent, by one or two percentage points. basket (EIF). The EU offer at year 3 is at 3.7% some 1.7 percentage points higher than the US offer. Consequently, the EU offer in the 7-year category is 1.7 percentage points lower than the US. therefore will leave the current imbalance in place until the endgame. on 99.3% of US exports to the EU and 98% on EU exports to the US. compared to the US offer. sugar-related products, ethyl alcohol, and rum. TLs), and food preparations (25 TLs). TLs), ball bearings (8 TLs), motorcycles and bicycles (2 TLs), glass and ceramics (2 TLs), nonferrous metals (titanium) (4 TLs), and batteries (1 TL). include sturgeon roe, sardines, tuna, fish sticks and caviar. lines (US 10,741 vs. EU 9,376) in the US 2013 nomenclature. meat, milk and cream, nuts, fruit jam and fruit juice, animal feeding and glues). annexed (Annex 1) in a comparative table. fiber, diapers, and other products with a component of textile materials). than a percentage point in the other categories. excluding cars, is located in the 3-year category. in the 7-year category include rather limited trade due to prohibitive duties, NTBs or SPS measures. chocolate (38 TLs), food preparations, tobacco, wool and cotton. (14% of the “U” category) and dairy products (12% of the “U” category). from the US side in order to restore some balance of concessions. sturgeon roe, tuna, sardines, caviar, fish sticks, crabmeat, swordfish and salmon. The EU backloaded lines include caviar and shrimps. Annex 1. Head notes and conditionalities in the respective revised tariff offers. This file has been shared by a user of PDF Archive. Document ID: 00368277.